Which fruits Hydrates your Skin best? Pineapple, Kiwi, Watermelon, Oranges and Melons. All these fruits have something in common: They are all high water content, therefore they are perfect to hydrate our skin inside out. 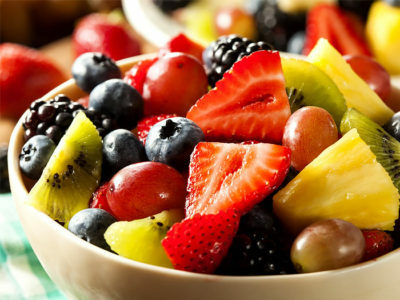 We are preparing some energetic drinks with these fruits today so we can have them to go to the gym or before jogging. First we are preparing a powerful infusion as a base for the drinks. With these energetic infusions we are adding the benefit of getting rid of tiredness and to improve our mood as well as hydrate our body and specially our skin, all in the same tasty drink. Base Infusion Ingredients: ½ cup of fresh Ginger, 1 spoon of Green Tea powder or 2 teabags of Green Tea, 2 teabags of Peppermint Tea or ½ spoon of fresh Peppermint. Add 1 liter of water to all ingredients and bring to boil, turn them off when boiling for 2 minutes and let them cool and then freeze in ice pop molds or ice cube trays. The next day you should have these ice cubs ready to be added. The amounts to use should be one cube of energetic to one cup of orange juice and another cup of chops of any of the fruits we mentioned, blend them all together in a blender at max speed for one or two minutes and drink it before going to the gym or before starting your exercise routine at home or jogging, wait 20 minutes and start exercising. You have one for every day of the week from Monday to Friday. Weekends you can drink the Aloe booster which is made out with 1 cup of chops of Papaya and the inner gel of a 3 centimeters slice of Aloe. This will give you an extra shot of vitamin E. Use a cup of orange juice and a cube of energetic infusion then just put them all in a blender and blend them for two minutes and drink it all, it’s a little bitter but its benefits are worth the effort. The benefits we are getting with each drink are instant hydration, extra energy, vitamins booster and a tasty moment that will rejuvenate you. Remember to ask to your physician before starting a new diet or alternative treatment.